Air Cleaning Specialists offers two model variations of Nordfab QF tubed elbows to be utilized as air flow directional. The collar on the outside of the tube is for outlet and the collar on the inside of the tube is for inlet. 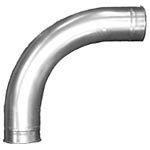 Nordfab's QF Long Radius elbows are available in 90°, 60°, 45°, and 30°. Both models come standard with QF rolled ends and are made available in galvanized, aluminum, stainless and stainless+ with optional no. 4 finish materials.